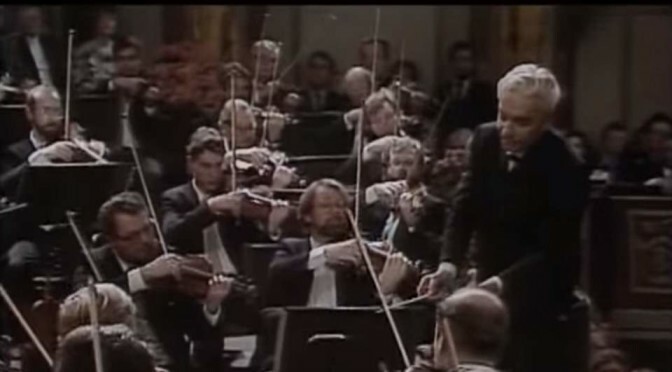 Conducted by Herbert von Karajan, the Wiener Philharmoniker (Vienna Philharmonic Orchestra) plays An der schönen blauen Donau, Op. 314 (English: “By the Beautiful Blue Danube”, simply known as “The Blue Danube”) by the Austrian composer Johann Strauss II. From the New Year’s Concert at Vienna, 1987. See the full concert here. Probably the most famous waltz ever written, the piece composed in 1866 and first performed in February, 1867. Since then, it has been one of the most consistently popular pieces of music in the classical repertoire, despite the initial performance was considered only a mild success. The waltz is traditionally broadcast by all public-law television and radio stations exactly at midnight on New Year’s Eve, and on New Year’s Day it is a customary encore piece at the annual Vienna New Year’s Concert. German composer and pianist Johannes Brahms was also a fan of the piece: when Strauss’s stepdaughter, Alice von Meyszner-Strauss, asked the Brahms to sign her autograph-fan, he wrote down the first bars of The Blue Danube, but adding “Leider nicht von Johannes Brahms” (“Alas! not by Johannes Brahms”). In 1865, Johann Herbeck, choirmaster of the Vienna Men’s Choral Society, commissioned Strauss to write a choral work; due to the composer’s other commitments the piece wasn’t even started. The following year, Austria was defeated by Prussia in the Seven Weeks’ War. Aggravated by post-war economic depression, Viennese morale was at a low and so Strauss was encouraged to revisit his commission and write a joyful waltz song to lift the country’s spirit. Strauss recalled a poem by Karl Isidor Beck (1817-79). Each stanza ends with the line: “By the Danube, beautiful blue Danube”. It gave him the inspiration and the title for his new work – although the Danube could never be described as blue and, at the time the waltz was written, it did not flow through Vienna. To the waltz, the choral society’s “poet” Josef Weyl (1821-1895, the Austrian humorist and translator) added humorous lyrics ridiculing the lost war, the bankrupt city and its politicians: “Wiener seid’s froh! Oho! Wieso?” (“Viennese be happy! Oho! But why?”). The piece was prominently used in the Stanley Kubrick’s 1968 epic science fiction film “2001: A Space Odyssey”. The waltz is heard as a space plane docks with a space station while another spacecraft departs for the Moon. It is also heard over the film’s closing credits.